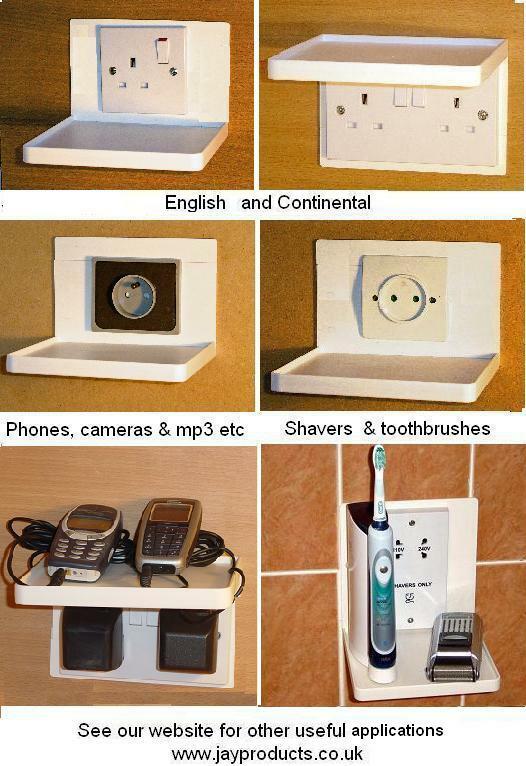 A handy shelf that fits around an electric socket within a couple of minutes. It needs no drilling and no electrician. There is no chance of an electric shock and in an instant there is a shelf for recharging your electric shaver, toothbrush, phone, Ipod or whatever you need, exactly where you want it. They are neat and unobtrusive and could be round the switch as you come into the house providing a place safely store your car/ house keys. It is even strong enough to hold a small radio or reading lamp. Just loosen the screws holding the switch or socket a few turns, fit part of the shelf down behind the top and the other behind the bottom. Finally just re-tighten the screws again …in an instant - a useful shelf all for £8.99 or less. This press release was distributed by ResponseSource Press Release Wire on behalf of Jay Products LTD in the following categories: Men's Interest, Leisure & Hobbies, Home & Garden, Women's Interest & Beauty, Manufacturing, Engineering & Energy, Construction & Property, for more information visit https://pressreleasewire.responsesource.com/about.